Photographed at Bird Rock Catalina Island using an Ikelite Substrobe Ai and Substrobe M with a housed Nikon F-2 and 60 mm lens. Exposed at f11. 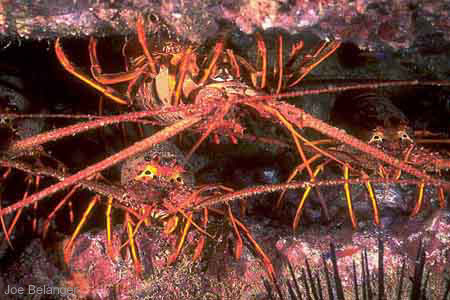 About the Spiny lobster: Found on rocky reefs in crevices and caves from the subtidal zone to 200 feet. Good eating considering that they are in the same family as a cockroach. Range from San Luis Obispo County, California to Baja California, Mexico. Size to 60 cm. Photographed using a housed Nikon N90, Nikon 105mm 2.8 macro lens with +4 diopter and 2 Ikelite Substrobe 200’s. Shot at f32 @ 1/60th on TTL. About: Photographed at Santa Cruz Island in 40 feet. Found on rocky reefs to 60 feet. 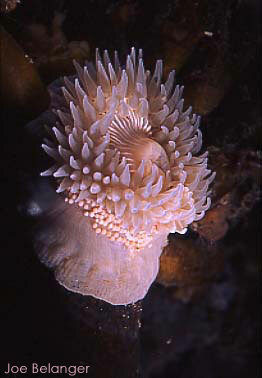 Juveniles live on column of mother until they slide off and become independent anemones like this one. Range from Puget Sound to San Diego. Size to 1.5" diameter (4cm). 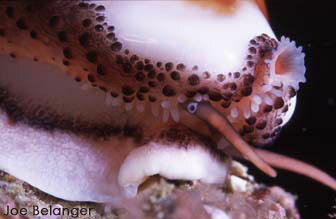 Photographed at San Miguel Island using two Ikelite substrobe M's with a Nikonos 1:1 extension tube setup at f16. 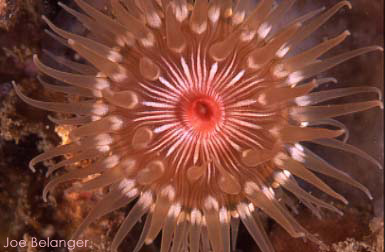 About the Proliferating Anemone: Found on rocky reefs to 60 feet. Juveniles live on column (as seen here) of mother until they slide off and become independent anemones. Range from Puget Sound to San Diego. Size to 1.5" diameter (4cm). Photographed using a housed Nikon N90, Nikon 105mm 2.8 macro lens with +4 diopter and 2 Ikelite Substrobe 200’s. Exposed at f16 @ 1/60th with -.03 EV. About: Photographed at Santa Cruz Island in 25 feet. Has very highly polished white and brown shell and when left undisturbed, the beautiful mantle is exposed to help keep the polished look, and you can see its eyes as shown here. Found in depths from 20 to 100 feet and range from Monterey to Baja, California.